Let Gibson Pest Control eliminate your "pest problems" today! With over 100 years combined pest control experience, we are a company you can trust for all your pest control needs. Every technician is North Carolina State registered or certified & extensively trained in the latest technology designed to rid your home or business of existing pests, as well as preventing future infestations. Always on time,friendly and reasonably priced! Local company offering great services. They did exactly what they said they would. When they said they would and at the agreed upon price. I have had Gibson pest control for many years, very professtional, I have no problem with pests since having them as my pest control service. Highly recommend them. Especially like the no chemical smell after treatments. We are very happy with Gibson’s Pest control service. They were right on time for our first meeting. They did a thorough tour of the property and quoted us a fair price. Their actual service has been outstanding. I've been using Gibson Pest Control for about two years now and they are excellent--very prompt in staying on schedule and also in responding to special requests. My house is ant- and flea-free now thanks to them! I would recommend them highly. Excellent service for many years. I have never considered another company. They did a thorough job in a very professional way...very nice to work with! Came out immediately and took care of probkem. Came out a second time as hoc within 24 because I’m a subscriber. Very friendly and professional. Very responsive and good at what they do. We have been using Gibson Pest Control for 10 years and are set up for them to come 4 times a year. We have vacation rentals and they do an excellent job at checking each property for stinging insect nests, mouse control, boring bee activity and sugar ant issues as well as keeping the general insects at bay. They are courteous and professional. I highly recommend them. Deb B. My husband and I have used Gibson Pest Control for several years and they’ve done an excellent job for us! 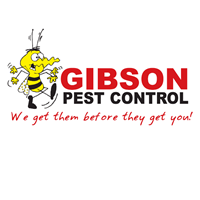 We have been using Gibson Pest Control for many years, both our business and residential. They are dependable, courteous and efficient. I recommend them for your pest control needs. Gibson reps are always punctual and efficient. Very polite, and attentive to our needs. We highly recommend Gibson! Very timely and informative about the pesticide they use! They even cleaned up after the exterior treatment! Great service and customer support. Impressive results - when we purchased our home in 2014, there was a significant rodent and insect problem. However, the Gibson team has eliminated our problems! They do a excellent job. Very friendly and professional. contract without hesitation. Thank you all! I just started with this service and found the staff very helpful. They answered my questions and explained all details to me. I had switched from another service which never took the time to explain how things worked. Great Company, fast and professional. Solved our pest problems with excellent results. Highly recommend! The man who sprayed my home was excellent and very professional. I would like him to come for my next spraying am not good with names, but I think it was Harry? I really appreciate the yearly contract with quarterly treatments and if I see an issue with bugs, they will come out to treat between scheduled times. That is truly a plus! Great service! The technicians are always friendly and on time. these guy stand behind their work. I was extremely pleased with how quickly and efficiently they came in and completed our service. We have four houses on the property and each house was given the attention it needed. I appreciate the professionalism and attention to detail . Always friendly with great service. On time & Great Work. so pleased that the same person comes out and knows the landscape- not to spray in my herb garden or my backyard garden. thanks. Friendly, professional, dedicated to the responsibility. Courteous prompt professional service, thank you. Great technician! Very thorough with his work. Gibson Pest Control has been our pest service for the last several years. They are a top notch company with very experienced technicians. They are always willing to go the extra mile to make sure the customer is well taken care of.